Diwali dawned this year with a flutter of excitement for me. I had spent the previous two days planning the sweets that I would make for the festival (with help from my mom ofcourse). I had come up with the final three. The first of the distinguished line up was carrot halwa. Carrot is naturally sweet which makes it a good choice, even as a vegetable, to be used in making a sweet dish be it a halwa, payasam or cake. Due to the lack of grater I had to use some innovation - used the peeler and blender combination to get thin, small flakes of carrot. Lack of some dressy ingredients dint put a dent in the taste of my halwa (but I am going to give you a complete list of what should go in). Go ahead and try this dish, you will be left with sweet satisfaction. Peel the skin off the carrots, cut off the edges and then Grate the carrots. Break cashewnuts into small pieces. Fry till golden brown in ghee/butter. Place a heavy bottomed vessel on a lighted stove. Put the ghee/butter into it and heat a little till it melts. Add the grated carrots to this and sautee for some time, say 5 minutes. 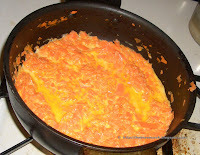 Mix such that ghee is spread over all of the carrot. Add the milk to this and allow this to boil on simmer. Keep the mixture boiling till carrots become real soft. Now add the sugar and mix well. Continue to boil this till the sugar is well blended. At this point of time you must not have any milky liquid in te vessel. (If you do, my trick is to pour it out into a glass, its a tasty drink). Put in the cardamom, saffron, cashewnuts and raisins. Keep boiling (all the time keeping the stove on simmer) till all is blended well. You can add condensed milk or even khoya when most of the milk has evaporated. This gives an excellent rich taste to the halwa. You could add roasted almonds and pistachio also the halwa for that special something.